The history of Ridge Vineyards begins in 1885, when Osea Perrone, a doctor who became a prominent member of San Francisco’s Italian community, bought 180 acres near the top of Monte Bello Ridge. He terraced the slopes and planted vineyards; using native limestone, he constructed the Monte Bello Winery, producing the first vintage under that name in 1892. This unique cellar, built into the mountain side on three levels, is Ridge’s production facility. At 2600′, it is surrounded by the “upper vineyard”, now referred to as the Perrone Ranch. 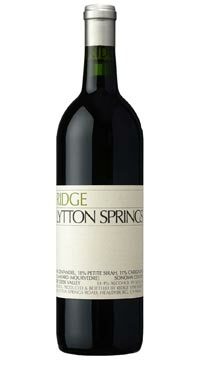 Lytton Springs, in Sonoma County, became part of the Ridge estate in 1991. Though born in the early sixties to the post-Prohibition world of modern California winemaking, Ridge relies on nature and tradition rather than technology. Ridge takes a pre-industrial approach to winemaking; find intense, flavorful grapes; intrude upon the process only when necessary; draw the fruit’s distinctive character and richness into the wine. This is a blend of 69% Zinfandel, 23% Petite Sirah, 6% Carignane, 2% Mataro (Mourvedre) from the Lytton Springs vineyard in Dry Creek Valley (Sonoma County). The grapes are hand harvested and ferment via natural yeast, slow and steady. The wine ages for 14 months in American oak which adds structure and spice. Complex aromas of raspberry, black pepper and vanilla. Full bodied with firm acidity, flavour complexity and a long finish.